Titouan Puyo and Olivia Piana have made it a clean sweep of the San Sebastian Paddle Tour for Team France, overcoming rough conditions and a strong field to claim Week 6 of the EuroTour here in the beautiful Basque Country. Titou had a four-way battle with Michael Booth, Leo Nika and Connor Baxter, eventually pulling clear as he milked the messy bumps for all they were worth, with Boothy looking strong again but having to settle for being runner-up, while an impressive Leo Nika claimed his second podium in the space of eight days. In the women’s, Fiona Wylde started strong and led early, however Olivia showed her strength in the flatter sections of the bit-of-everything course to storm away with the win. It was a see-sawing battle, but Olivia’s raw power was too much for the youngster, with the Frenchwoman eventually crossing exactly five minutes clear after Fiona faded in the final couple of kms. Crossing third was April Zilg, who gets a well deserved podium spot to finish her EuroTour campaign, which began way back in St. Maxime. Just outside the podium, it was a fantastic performance from Melanie Lafenetre, who held off last week’s third place finisher, Laura Quetglas. Highlighting just how difficult the conditions were, four of the women and five of the men (in the elite divisions no less) failed to finish the highly-challenging course. Starting inside San Sebastian’s protected bay at La Concha Beach, paddlers headed straight out into the wild and woolly open ocean, where the wind was whipping up bumps in seemingly every direction, something that wasn’t helped by the rocky cliffs that were producing chaotic backwash. There were some scary/entertaining moments as several of the leaders attempted to “cut the corner” and take a line very close to the cliffs, which resulted in several falls and at least one paddler ending up on the rocks. The ocean masters came into their own at this point, somehow turning the multi-directional chaos into rideable downwind bumps. 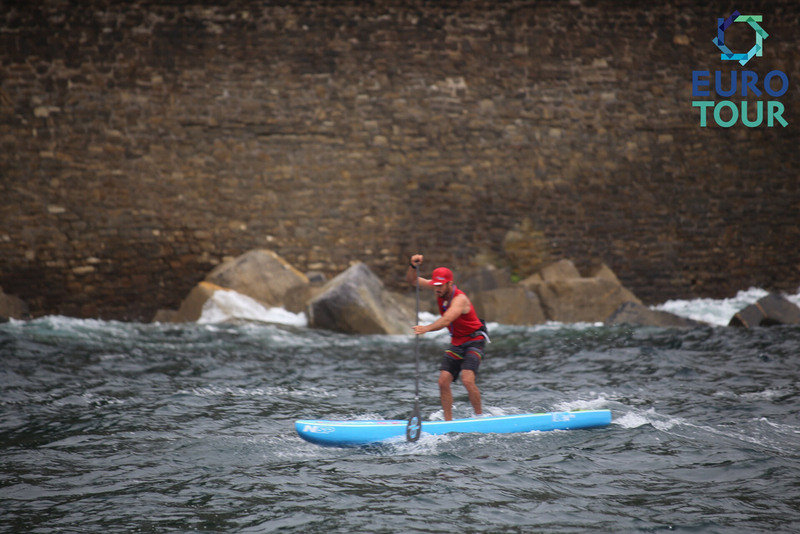 Although it was certainly challenging, many paddlers commented post-race that this was the funnest part of the course, which today took in almost every type of paddling condition. Zane Schweitzer, who came into the race still reeling from a shoulder injury, made an early move by taking a bold line along the rocks, relishing the open ocean bumps and pulling ahead to the front the field. But he was soon joined by the likes of Titou, Connor, Boothy and Leo, who had a blinder of a race. By the 3km mark a group of four guys had pulled clear – three Starboards and an NSP – with Connor leading Leo, who was just ahead of Titou, who was narrowly in front of Boothy. As they entered the relatively protected waters of the San Sebastian river, the race began to take shape, with the front four gapping the rest of the field by a wide margin. For the rest of the first lap it was the top four neck-and-neck, with the beach run that signaled the start of the second and final lap highlighting just how close the guys were, with only 20 seconds separating 1st-4th in a race where drafting was almost impossible. Titou came into his own on the second lap though, with the NSP/Quickblade/VMG team rider powering away in the open ocean bumps that he loves so much. Having qualified for Team France and secured a ticket to Fiji at the French selection event yesterday, Titou was clearly in a good mood and it showed in his paddling, as he broke away from the other three contenders to take a stranglehold on the race. Boothy never gave up though, breaking Leo and Connor on the second river leg and looking determined to reel in Titou; Boothy had to win today’s race to keep the overall EuroTour title chase alive, but he couldn’t match the new Caledonian in the open ocean bumps and had to settle for second. Titou, with his trademark silky smooth technique, powered home over the final kilometre, crossing the line half a minute a head of Boothy, who continues his amazingly consistent run of results here in Europe – 2nd, 1st, 2nd, 2nd. Leo Nika, who has gone from strength to strength in Europe this summer, crossed just 20 seconds later for a well deserved podium spot, while Connor, who admitted post-race he’d started backing off and conserving energy as soon as he saw Titou paddling clear for the win, eventually crossed three and a half minutes later. There was heartbreak for Trevor Tunnington, who crossed in 5th but was soon DQ’d for accidentally skipping one of the marker buoys. And also for Jake Jensen, one of the pre-race favourites who retired on the first lap; Jake made a critical error in taking a 21 inch wide flat water board out into the wild open ocean (in his defense, we couldn’t see how bad the bumps were from the start line). The Aussie also ran into one of the phantom slabs beside the cliffs, which were dredging dry at random times and causing real havoc for some of the unluckier paddlers. But the day belonged to both Titouan and Olivia. It was a fitting double victory for the French duo, who just yesterday qualified for Team France and earned a ticket to the ISA Worlds in Fiji. Thanks to the local organising crew for creating such a great race. Although the conditions were super challenging, every paddler I spoke to said how much fun it was. Definitely a big change up from the flat water racing we’ve grown accustomed to. We’ll have plenty of photos and video of the action later tonight or tomorrow, but for now you can get the full results from the elite divisions below. 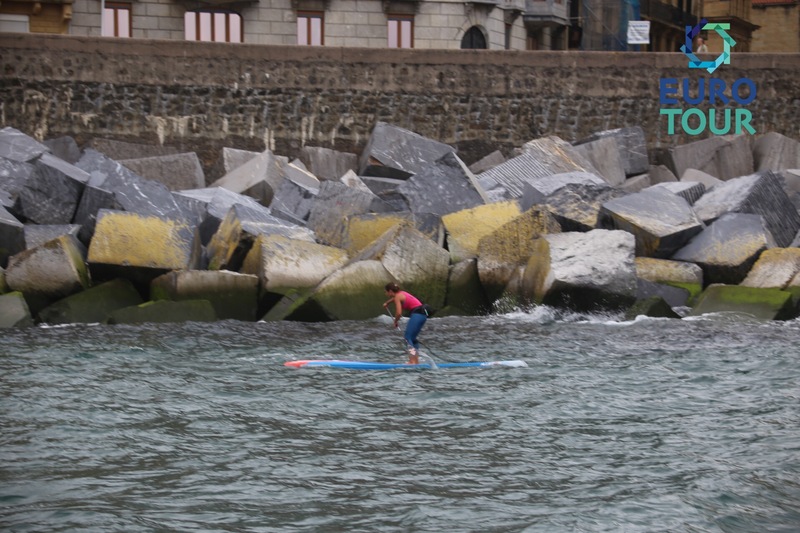 UPDATE: Plenty of great photos up on the official EuroTour dropbox, and some more over on the Hondarribia SUP School FB page via local legend Triki. Oh and you can also watch a full replay of the EuroTour ‘Starboard Live Stream’ presented by VMG Blades. Thanks to everyone that tuned in, and especially those that left a comment and joined in our spot trivia contests. Apologies for the shaky footage — the humble little gimbal couldn’t handle the crazy bumpy conditions out there on the boat! Looking for a new Facebook Live camera for the next stream, maybe the DJI Osmo?